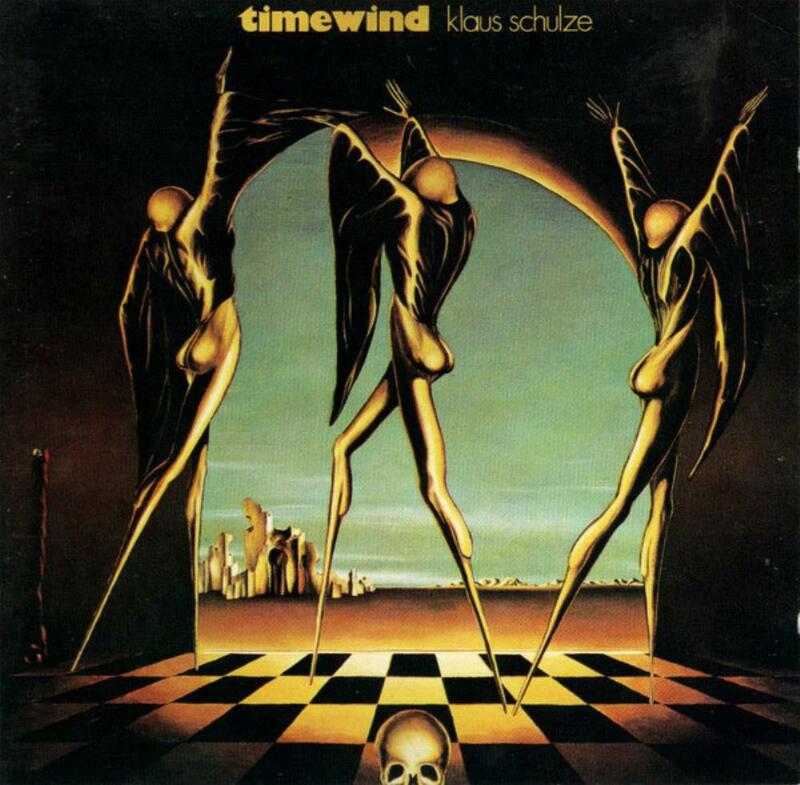 Fifth opus by the German drummer and experimenter, "Timewind" is the album that genuinely establishes Klaus Schulze as an electronic music pioneer. After his early drone experiments and the transitional but nonetheless very interesting "Picture Music", the young artist really begins to take confidence on new synthesizers technologies and adopts the formula that will become his trademark: (very) long, deep, immersive and slowly evolving sonic landscapes. The sound effects are now more polished, mastered, and the usage of sequencer has definitely been adopted. The two 30 minutes pieces are a worthy testimony of both the musical freedom and spontaneity Schulze insufflates is his albums. Instead of hearing melodies, we dive into enigmatic ambiances that needs time to develop. Each composition has a beginning, but do they have a true end? Klaus Schulze particularly enjoys Richard Wagner and dedicated "Timewind" to him. Logical when you take a look at the track-list. The German classical composer moved to Bayreuth in Bavaria, where he founded the "Bayreuth Festival", dedicated to his ten main operas. The festival still takes place nowadays. He lived in the "Villa Wahnfried", and died in 1883 in Venice. Therefore, "Bayreuth Return" and "Wahnfried 1883", which could also be described as "symphonic progressive electronic music", are clearly a tribute. Supposedly composed during an aware dream, "Bayreuth Return" was recorded in less than 2 hours in the night of the June 3rd, 1975, just after Schulze woke up on purpose. And that's really what this 30 minutes piece is about: a genuine awaken dream. Over-trippy interlacing loops textures weave a superb, meditative and surrealistic landscape. Slightly TANGERINE DREAM-esque, it resembles a retro-futuristic whirling dervish dance. At the end, the sequence is surprisingly accelerated. Fantastic! One of the greatest achievements from Klaus Schulze and even from the Berlin School! Like TD's "Phaedra" and Manuel Göttsching's "Inventions for Electric Guitar" albums, released during the same period, it will without any doubt have an influence on the trance genre from the 90's. More atmospheric and non-sequenced, the ambient "Wahnfried 1883" is slow and contemplative, as if you were if you were discovering a desolated extraterrestrial landscape. No real melody or catchy passage here, you have to be concentrated to really enter this track. Hypnotic, mystical and innovative for 1975, however I still personally prefer the more lively "Bayreuth Return". Good "new-age" music before new-age music even existed? Perhaps... An inspiration for NEURONIUM? Certainly! Simply a progressive electronic classic, "Timewind" is an iconic album the 70's the Berlin School, and also one of Klaus Schulze's best offerings! An essential listen, and the one to start with, especially for fans of TANGERINE DREAM.